Only Accepting First 12 Teams Per Division. Register Online Today! CORPUS CHRISTI, TX – The Corpus Christi Parks & Recreation Department is offering a new sport program for adults. 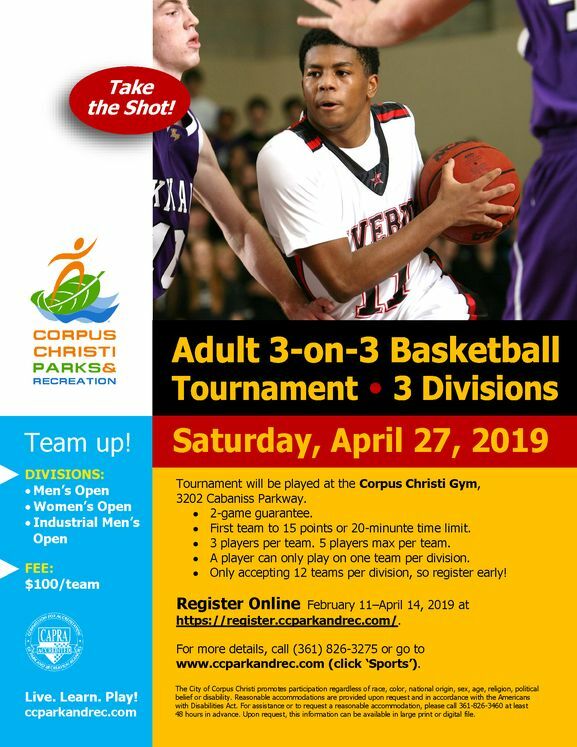 Test your skills on the court in our Spring 2019 3-On-3 Adult Basketball Tournament on Saturday, April 27, 2019, at the Corpus Christi Gym located at 3202 Cabaniss Parkway (map). This tournament will have a 2-game guarantee. The three divisions are Men’s Open; Women’s Open; and Industrial Men’s Open. We will only accept 12 teams per division, so register early. REGISTER ONLINE now through April 14, 2019, for $100 per team at https://register.ccparkandrec.com/.